Soon after the Cold War ended the Navy announced a “change in focus and, therefore, in priorities for the Naval Service away from operations on the sea toward power projection.”1 A new operating focus on low-end missions such as partner development missions, striking land targets, and deterring rogue regimes came to dominate its focus. Different training followed. This training and operating paradigm replaced the high-end threat focus the Navy was originally made for in an era of great power competition against the Soviet Union. But the shift was wholesale, and did not attempt to preserve a responsible minimum of important skills that still held relevance. Perhaps worst of all, somehow this shift allowed U.S. Navy training to fall to incredible lows and remain there for most of a generation. This limits the freedom to play an accurate opposition force. Capt. Rielage remarked that Red teams are most often constrained and used to only “perform a specific function to facilitate an event” (such as an individual training certification event) rather than behave like a thinking adversary. Many naval platforms are multi-domain in nature, with the ability to attack targets in the air, on the ocean, and beneath the surface. Cross-domain fires are the norm in war at sea, such as how a submarine can fire missiles at a ship from underwater. Sinking a modern warship is at least a matter of knowing how to fight targets on the surface and in the air at the same time, simply because ships can fire missiles at each other. Naval warfare involves sensors and weapons that can reach out to hundreds of miles from a single ship. The scale of this multi-domain battlespace can be enormous while containing numerous types of threats. Through this complexity war at sea can be filled with an incredible scope of possibilities and combinations. Even in an era absent great power competition rogue regimes like Iran still field multi-domain capabilities such as submarines and anti-ship missiles. Practicing only one skillset at a time using cannon fodder opposition forces that almost never win barely scratches the surface of war, yet this is exactly how the U.S. Navy has been training its strike groups for years. In recent decades it appears the Navy did not have a true high-end threat exercise until Admiral Swift instituted the Fleet Problem exercises two years ago.9 It must be recognized that because the Fleet Problems are so new they still may not accurately represent real war. Instead, they simply set and combine the basic conditions to present a meaningful challenge to train for the high-end fight. The Fleet Problems are large-scale, long-duration, and open-ended events. Large-scale, in that the unit being tested can be a strike group or larger; long duration, in that the exercise is at least several days long instead of less than 24 hours; open-ended, in that they give wide latitude to the troops involved rather than narrowly constraining them to execute proscribed methods.10 Perhaps most critically, the Fleet Problems include an opposition force that is capable of inflicting painful losses. They also force the Navy to exercise multiple warfighting areas in combination rather than one at a time, which was the standard design for the Composite Unit Training Exercise (COMPTUEX) that was considered the peak of high-end sea control training in every deploying strike group’s workup cycle.11 The novelty of the Fleet Problems suggests the Navy’s overseas exercises on deployment were not much better. While these individual training conditions are not totally unprecedented in the Navy the Fleet Problems appear to be the first events in many years to effectively combine them on a large scale. 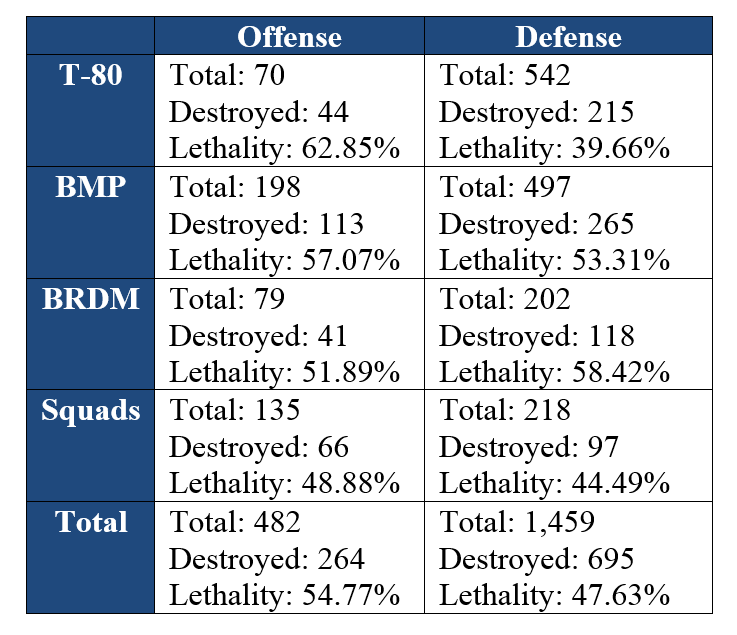 Original caption from source: This table captures the lethality of four armored BCTs (ABCTs) that trained under live-fire conditions at NTC by outlining the total number of threats presented to the ABCTs and the effects of the BCTs’ weapon systems. Of note is that greater than 94 percent of the “enemy” destroyed during these live-fires were destroyed with direct-fire systems (including attack aviation), meaning that our formations fought a “fair” fight. Scripted training might come from some organizational pathology born from a zero-defect culture, a failure to evolve target practice into something that resembles dynamic battle, or some other combination of complacence and lack of imagination. What is certain is that it bears little resemblance to the sort of wars the military of a superpower can be asked to fight. “Peacetime maneuvers are a feeble substitute for the real thing; but even they can give an army an advantage over others whose training is confined to routine, mechanical drill.” –Carl von Clausewitz, On War. Cutting training time is not necessarily wrong however because training could go on forever. Even with cuts ships still have months of time devoted to training within the workup cycle and more opportunities when deployed. The Navy cannot blame operational demand or maintenance backlogs alone for compressed training. Instead, it is the fault of poor decision-making on how to structure the training process and assume risk. Time pressures encouraged scripted events because training can be passed more quickly. Hard training involves repeat attempts after failure, a larger selection of open-ended scenarios, and a thorough after-action review process. All of these things cost time. Scripting can help make time for more events and cut corners when needed. Scripted training became an important means to help Sailors stay on schedule in a system that was overburdened with too many requirements. These excessive requirements come from a desire to cover too many bases. A warship, being an advanced machine, can experience technical failure and take damage in numerous ways. Ships can also be employed in a wide range of missions. Training to manage the degradation of a ship and the complexity of naval warfighting is an incredibly difficult task. However, it is impossible to train to every kind of scenario or prevent every kind of failure. A training system represents calculated risk where strong proficiency in some areas must come at the expense of skill in many others. The Navy has allowed the technical complexity of its ships and the flexibility of naval power to overwhelm the ability of Sailors to effectively train for war. Miscellaneous administrative burdens have also ballooned. Risk aversion has been mistaken for due diligence where a risk averse culture prone to adding training and inspections sought to mitigate risk that should have been accepted. Now it has become impossible to expect Sailors to become skilled at core warfighting tasks when there are too many boxes to check. The training certification system has become so backward it is inhibiting the very sort of skill it should be promoting. According to Vice Admiral Joseph Tofalo, recent commander of the U.S. submarine force, they were “…really working hard by taking a hard scrub of our assessment and certification process” just to make only 10-15 days’ worth of time to insert high-end threat training into the months-long workup cycles of submarines.23 The bloated certification system is suffocating the ability of senior leaders to implement meaningful training reform. But even with a bloated system why is it such a struggle for the Navy to make so little time for one of the most important types of training there is? Most of the Navy’s training is not actually training in the fullest sense of the term. Rather, most events appear to be readiness evaluations. The intent of a readiness evaluation is not necessarily to create an in-depth learning experience, but to pass an event and earn a certification that indicates a unit is competent at a certain task. The term “certification” is almost always used in relation to the intent and end result of Navy training. Sailors in the fleet are often worrying about maintaining their numerous certifications because they require periodic refreshing. Good training is about pushing to failure, testing limits, and taking risk head on. This makes it necessary to have training events that do not culminate in a pass/fail evaluation that can reflect poorly on a participant. When under evaluation one will likely fall back on previously known methods instead of using the opportunity to try something new. By frequently conflating readiness evaluations with training the Navy has failed to create enough space where Sailors can safely experiment and learn from their mistakes. A singular focus on certification can encourage scripting because the goal simply becomes passing the next event rather than genuine improvement over time. Scripting away risk makes the chances of passing certification events much better. Yet much of the point of military skill is in knowing how to manage violent risk. The quality of any certification is based on the standard of training it was earned through. How credible is a warfighting certification earned through scripted training? Winning is not about being the best, but simply being better than the opposition. In this vein, how does the U.S. Navy stack up against its chief rival, the Chinese Navy? The Office of Naval Intelligence (ONI) regularly releases unclassified reports on foreign navies. Its reports on the Chinese Navy (People’s Liberation Army Navy – PLAN) criticize training shortcomings that the U.S. Navy is itself committing. However, these reports also paint a picture of a force that is serious about training harder and working to overcome past disregard for realism. 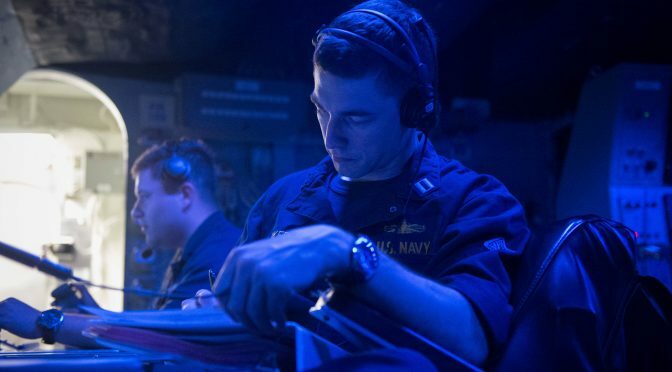 In addition to being chief of intelligence for U.S. Pacific Fleet Captain Rielage also serves as the senior member of the Pacific Naval Aggressor Team (PNAT) that was created a few years ago.28 PNAT seeks to incorporate intelligence insights on adversaries to create accurate representations of their thinking and behavior. PNAT then puts these insights into practice by leading opposing forces in certain events such as the Fleet Problems where Admiral Swift says PNAT “frequently surprises” leaders all the way up to the four-star level “unlike current strike group training.”29 Capt. Rielage also has interesting insights into how Chinese Navy training is evolving. For years the U.S. Navy has not tried to practice destroying modern fleets, but the Chinese Navy has. The importance the PLAN places on training is also reflected in its leadership. 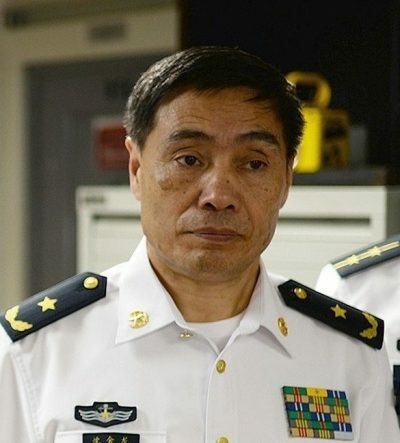 While serving as Commandant of the Naval Command College and prior to becoming the current chief of the PLAN Admiral Shen Jinlong helped create a “Blue Force Center” that seeks to improve the realism of opposition force training. Earlier in his career he served as director of a naval vessels training center and was credited for establishing a training system for new-type ships.32 The current leader of the Chinese Navy is no stranger to training innovation. The rate of tactical learning in the PLAN compared to most other navies is especially high, and not just because of its training values. With a hint of condescension the 2015 ONI report said that before the PLAN expanded its distant operations in 2009 it was “largely a training fleet, with very little operational experience.” But a force focused on hard and realistic training can certainly be effective when it will count most in war. The PLAN still has very few steady overseas commitments, and can afford to spend the bulk of its readiness on force development just like the interwar period U.S. Navy.33 On the other hand the modern U.S. Navy is stretched thin across the globe, and chooses to spend most of its readiness on overseas operations which are not the same as focused force development conducted close to home. The American and Chinese Navies have been spending their time on very different priorities. Regardless of where they stand in relation to one another on the continuum of military excellence it appears the Chinese Sailor is learning and becoming a more lethal professional at a rate that far outstrips his American rival. “If we fight our fleets in mimic fights against each other, every officer and seaman, and fireman, and ward-room boy will understand enough to become interested. What we need more than anything else is to make our people interested…certainly no profession gives the opportunities for continued interest that ours does…yet is there anything more heartbreaking in its dullness than a man-of-war is often made to be!” –Commander Bradley A. Fiske, “American Naval Policy,” 1905. A key distinction between institutions that provide security and most other organizations is that they rarely get to apply the full scope of their potential until an immediate threat demands a response. Most other organizations operate under a steady grind where they regularly apply foundational skills and often in direct competition against many others who are doing the same. Until an imminent threat appears an organization focused on security must remain in a self-imposed state of vigilance. This comes with unique challenges of promoting professional satisfaction and morale. Being a sentry, as important as that may be, is hardly gratifying. The logic of promoting deterrence is often not tangible enough to be professionally fulfilling on its own to most who wear the uniform. After spending an ungodly amount of time filing paperwork, attending sessions, and conducting so many other preparations warfighters crave the opportunity to do their job and put their skills to the test. An organization focused on security should conduct hard training not only for the sake of preparedness but to give its people opportunities to push their limits and enjoy the fulfillment of becoming a better professional. In the absence of a pressing mission that demands the immediate use of specialized skills a focus on growing those skills is the next best thing. While the Navy featured prominently at the opening of many campaigns and saved lives in humanitarian disaster the emphasis on low-end missions and training hardly helped Sailors experience the full potential of the powerful Navy they joined. The power projection era precluded Sailors from practicing many of the core high-end missions and skills a superpower Navy is usually built for, yet Sailors were still responsible for the extensive maintenance that high-end capability required. Scripted training under the bloated certification system has turned most tactical training into just another chore on a checklist rather than a stimulating exercise that focuses on quality learning and professional development. The professional development opportunities that come with joining the most powerful Navy should be especially unique. In how many places can someone practice warfighting skills and operations using some of the most advanced warships ever made? How many jobs allow someone to become the best in the world at taking command of the seas through skill of arms? Surely there is some connection between the level of opportunity to grow as a better warfighter through hard trials and the unique job satisfaction that comes with being a military professional. Has the Navy harmed retention and morale by letting too many requirements, inspections, and low-end missions crowd out time for hard training? Clearly people joining the Navy would much rather be “forged by the sea” instead of forged by their inbox. The training certification system is unable to maintain a consistent standard across the force because luck plays an important role in how well the American Sailor gets trained. The fixed nature of the workup cycle and the variety of deployment experience create a roulette wheel of training opportunity. A Sailor can report to a ship only to spend the entirety of their assignment stuck in drydock with limited operating time. A Sailor that happens to report aboard closer to a deployment will have far more opportunity to conduct at sea operations, especially integrated training within a larger group of ships.34 One Sailor can deploy to mainly exercise with numerous third world navies while another’s deployment can feature exercises with more capable allies. The nature of the workup cycle and the variety of overseas experience sends a hodgepodge of training experience throughout the Navy’s ranks. This creates the need for major training events that are disconnected from the deployment cycle to better standardize proficiency. By the time a combat arms leader becomes a general officer in the Army or Air Force they have usually paid multiple visits to Red Flag and the National Training Center across their career. While machines reflect learning as they grow in capability corporate memory is mainly carried forward by people. In this respect the Navy’s wholesale shift toward power projection not only inhibited its ability to practice war well, but failed to preserve a responsible minimum of institutional memory for full-spectrum competence. As Cold War-era personnel retired and separated from the service the Navy hemorrhaged skills and experience born from a time of better warfighting standards.35 Those with Cold-War era experience who still serve today saw their tactical skills atrophy under a new strategic focus. The result is that on average American Sailors know far less about high-end combat and sea control than they did 30 years ago. An organization that often describes its training in terms of “reps and sets” should have also understood the concept of use it or lose it. American Sailors can put their training into a different “reps and sets” context. How many times have they run the exact same scenarios? How many times have they seen a live opposing force defeat a strike group? Are scripted exercises the defining training experience of a generation of American Sailors? In a system where everyone gets a trophy it is hard to know who is any good. But training should not always be about winning or passing a test. Training is supposed to be a learning experience where failure is welcomed as an opportunity to learn and further prove oneself. Scripted training inhibits arguably the most important part of the training process – the after-action review. In the after-action review troops are expected to confront their mistakes, reflect upon alternatives, and contemplate their thought process. Without failure or the fear of future failure there will be less to question and reflect on. A solid after-action review process is necessary to give people a space where they can distinguish themselves as learners. The after-action review of a training exercise can be a most humbling experience for the military professional where leaders are forced to take responsibility for mistakes that would have gotten their people killed in war. How a leader accounts for such consequential errors can reveal something about their command philosophy and leadership style. There is also a large difference in taking responsibility for failure within view of hundreds if not thousands of participating Sailors after a live exercise versus a virtual wargame that is played in the company of only a handful of fellow officers. The highly concentrated nature of modern naval capability and authority has given the enlisted Sailor virtually no ability to shape his or her fate through tactics in high-end war at sea.36 It is on the ship’s officers to know how to fight well for the sake of everyone else aboard. Scripted exercises inhibit the warfighter’s ability to develop the unique professional skills critical to success on the battlefield. These special skills can range from employing warfighting techniques and tactics, maintaining unit cohesion while taking heavy losses, and knowing how to gamble with equipment and lives. Skillfully managing the chaos of war favors certain personal qualities such as the utmost candor, open-minded thinking, and a willingness to push to failure. These traits hardly describe the character of heavily scripted training. Without hard combat trials one cannot prove skill and virtue in ways only a warfighter can. What scripted exercising has done to the Navy is damage its ability to discover those within its ranks who best exemplify the profession of arms. If the most important peacetime military mission is to realistically prepare for war then what happens if this primary mission does not act to unify effort across the enterprise? Compared to all other peacetime operations exercises are the activity that come closest to real war which makes them an indispensable foundation for force development.37 Realistic exercising is what best integrates and filters the vital functions that evolve training, tactics, and doctrine. Exercises are also some of the best means for investigating the changing character of future war as technology evolves. The lack of realistic exercising is much more than an issue of questionable operator skill. It is a broader developmental problem for how the Navy is deciding its future. It should go without saying that trying things in the real world under challenging conditions is how to mold vision into reality. The choice to disregard realistic exercising for a generation overlapped with a time when evolutionary ideas and networking capabilities were hitting the fleet. As the Information Age excited the imagination the Navy hailed transformative warfighting concepts such as ForceNet and AirSea Battle, but to the average Sailor these concepts changed little. There never was any serious AirSea Battle training, network-centric warfighting doctrine, or exhaustive tactical development for new major capabilities like CEC. The Navy certainly made an effort to transform, but progress and proficiency should never be measured by how many new capabilities come online, CONOPs or TACMEMOs that get published, or wargames that get played. If these things are to have life then they must be taught to and refined by those charged with their execution. Real progress and skill is best defined by what the Sailors and commanders on the deckplate know how to do well, and for that there is only training. Because warfighting concepts did not translate into new and realistic force-wide training many of the Navy’s most ambitious efforts to transform can safely be described as stillborn. If the Navy’s standards of exercising have been so poor for so long then it is natural to be skeptical of other elements of force development that feed into one another such as wargaming and test and evaluation. The functional linkage between strategy, tactics, and technology demands that force development activities use a shared set of realistic standards that evolve together to pace threats. Excessively scripting the one activity that comes closest to real war means failure was not a meaningful force of change for much of the naval enterprise. Clearly many unhelpful things have made it into the fleet if realistic exercising was not there to set a standard, serve as a proving ground, and anchor the Navy’s focus on warfighting. Part 2 will focus on Firepower. As a Lt (NFO) in the mid 80s I did a ships company tour as a Tactical Action Officer on the USS Coral Sea. In that capacity I went through two entire workup cycles for deployments. My feelings and observations back then were the same as expressed by this author. The exercises were canned and preordained and often unrealistic. They were seen as checks in the box to be gotten done. I really think that experience was the final straw behind my decision to resign with 10 years in. As satisfying as it was to participate in daily aircraft and ship operations I didn’t feel like I was part of a warrior force so much as a bureaucratic one. I guess little has changed.